Prices are based simply on a single element: time. Prices are determined by the number of hours spent on the artwork. The average size of each piece depicted in the portfolio is 8 1/2 x 11 inches drawn on 11 x 14 inch #300 smooth bristol board. Each artwork displayed in the portfolio was done from photographs taken by the artist or submitted to the artist from other sources. The quality of the artwork will vary, depending on many factors, to include the quality of the photograph that is used as the basis for the artwork. The better quality the photograph is, the better quality the artwork. Using some of the artworks displayed in the portfolio displayed on these pages, the average number of hours spent on a portrait varied anywhere between 7 hours and 20 hours of work. The time allocated to a portrait, landscape, etc. can vary depending on the detail work required to render the piece of art. 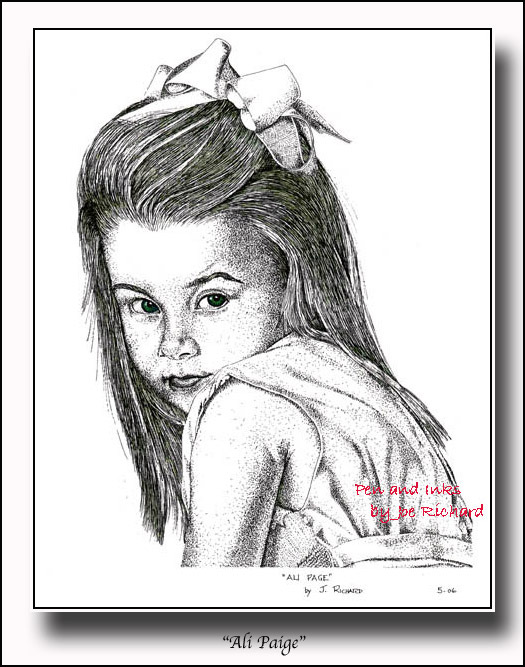 Depending on the subject matter, artwork of -- for example -- a child or a young woman with delicate features, the artwork is done using a stippling effect. The effects are dramatic in appearance, but as you could imagine, time consuming to draw each and every dot used to complete the work of art. Shipping will be via USPS and charged the current rates. A deposit will be required prior to beginning a piece of art.